Honestly, I would’ve happily paid $100 for the Dash Rapid Egg Cooker, considering how much use I continue to get out of it. 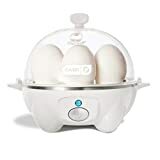 This awesome gadget cooks perfect eggs every time you use it, and it can handle all different kinds of preparations including hard boiled eggs, soft boiled eggs, poached eggs, scrambled eggs, and more. Heck, it can even cook omelets with with push of a button. It’s definitely worth its weight in gold, but you’ll be happy to learn that it’s on sale right now on Amazon at its lowest price ever — under $18!